The Old Globe Theatre was demolished in 1644. It took the vision and drive of Sam Wanamaker to initiate the development and reconstruction of a New Globe Theater. 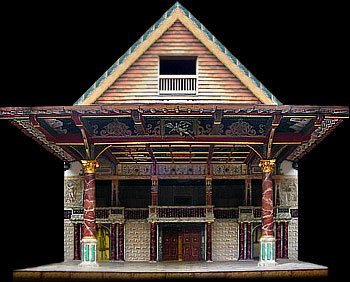 To create a replica a reconstruction, in London, of the old Shakespearean Theatre. There were two Globe Theatres in the London of the Elizabethans and Jacobeans. The first was built in 1599. This first Globe Theatre was burnt down in 1613 when a canon was fired during a performance of Henry VIII. 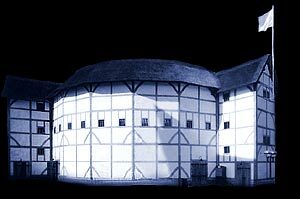 A second Globe Theatre was built in 1614 which was rebuilt on the original foundations of the first theatre. The roof on the second theater was tiled, not thatched! This theatre was demolished by the Puritans in 1644. So the New theatre in London is in fact the third construction to be built in the same area of London - but 350 years later! Scholars and architects looked at the information available regarding the building and the structure of the old theatre and plans to build a replica, a reconstruction, of the old theatre were drawn. The structure, design, layout and dimensions of the new Globe theatre follow. Excavation works for the New Theater Excavation of the site begins 1987 The "diaphragm" wall, on the side of Theatre closest to the Thames, is constructed to keep the water out. Structure - Access to the Balconies & Galleries Design - Two sets of external stairs in the structure , either side if Theater. Heating / Air Conditioning Like the old Globe as the design and structure is an open air amphitheatre there is no heating or air conditioning. The ' yard ' - Dimensions Dimensions - The stage projects halfway into the ' yard ' which is 80 feet in diameter. Design and Structure - The seats in each of the three levels of galleries are tiered with three rows of seats in the structure , increasing in size towards the back, following the shape of the building. The galleries are covered affording shelter from the elements.